I'll be traveling for a few days. I may update here but even less assiduously than usual. 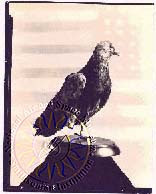 A pigeon named Cher Ami was a hero of the Lost Battalion episode in the Argonne Forest in WW I. The whole story is touching (worth the quick read). He survived his travails, the medics carved him a wooden leg, he won the Croix de Guerre with Oak Leaf Cluster, and now Cher Ami is on display in the Smithsonian. Prop comic Gallagher (the Original Gallagher, watermelon smasher) gives a bizarrely bitter interview in The Onion AV Club. [He may be a bit difficult: issues with his brother left him estranged from his whole family. This Wikipedia article on the sibling issue differs from the story I've heard and seems to have been written by Original Gallagher himself -- much the same wording appears in the Original Gallagher's press material. ] Anyway, he's not putting his best foot forward in that interview. Whatever he says I hear "After all the watermelons I smashed for you, this is the world I get? Richard Herring (a UK comedian) has a bold idea: he's writing a sketch show called As It Occurs To Me each week, getting a couple performer friends (Emma Kennedy and Dan Tetsell) to perform it with him live before an audience on Monday, and puttng it out as a free podcast by the next day . This seems like a cut-out-the-middleman tactic that could make sense for some small set of writer/performers. He hopes to sell enough live tickets to at least break even. I wouldn't be surprised to see more such things spring up. (I'm assuming, but don't know for sure, that it's not been done previously).